Toilet: Ek Prem Katha has something pertinent to say but isn't clever enough to venture beyond screaming platitudes, notes Sukanya Verma. In Hrishikesh Mukerjee's winsome Kisi Se Na Kehna, Utpal Dutt's buttoned-down patriarch looks down on all things modern as evil and a threat to Indian culture. He insists on finding a traditional, illiterate daughter-in-law for his son (Farooque Shaikh). As it turns out, his son is in love with a smart, educated doctor (Deepti Naval). He doesn't have the courage to evoke his heart patient father's wrath and devises an elaborate scheme to pass her off as a village-dwelling sanskari bahu until the truth is discovered and preconceptions are cast off. Mukerjee makes a good point about unfair prejudices with a healthy mix of amusement and sympathy. Somewhere in that bombastic tone and overblown revolution of Shree Narayan Singh's Toilet: Ek Prem Katha lies a similar story of a quick thinker and his offbeat tactics, scrambling to create an environment of coexistence between his dynamic wife and bigot bapu. Except the problem here is even more basic than education -- it's the right to relieve oneself in private. Open defecation is a cause for great concern in India, one that grows despite campaigns, catchphrases and allocated budgets revealing irregularities in supervision as well as its object's warped views on sanitation. Toilet: Ek Prem Katha has something pertinent to say but isn't clever enough to venture beyond screaming platitudes to underscore its milieu of antiquated values. It's the sort of meaningful cinema that pauses to linger on Sana Khan's cleavage, lust over Sunny Leone, jest about Hrithik Roshan's thumb detail, and where Mathura district's small-town fervour and conservatism fills the frames, yet characters talk Ray Ban and Syria and idle away on smartphones quite comfortable in their toilet-less existence. More implausibility follows when a considerable chunk of its 161 minutes running time is wasted to manufacture a romance between a 36-year-old Keshav (Akshay Kumar) and a studious Jaya (Bhumi Pednekar) over a stale pattern of he stalks-she berates-he ignores-she pursues-both fall in love and get married. Akshay's age is repeatedly pointed out lest we forget how gutsy it for a superstar to play a character almost 14 years younger than his real age. Perhaps it's the generation gap that makes it hard for him to fathom why his new bride is making a big fuss over the lack of toilet in their house. Jaya is livid to learn about the existence of an early-morning communal event wherein women squat in the fields and lighten their load over gossip and gas. Used to doing the deed in privacy, such humiliation is unacceptable to her. Although Keshav is unable to understand her firm resistance at first, he comes up with ingenious ways -- jugaad -- to ensure she doesn't have to join the 'lota party' even as his dogmatic father refuses to permit a toilet at home. The Keshav-Jaya story acquires a more personal skin in crisis. Keshav may be a product of his conditioning but he's driven by his emotions. An ordinary man's ascension into decency and compassion and a woman's tenacity to accept nothing short of what's her fundamental right, if only Toilet focused more on this. As long as it appears to be a domestic matter, there's credibility in Keshav-Jaya's challenges as well as the solidarity they deal it with. But when it becomes a full-blown crusade, it's almost sycophantic in its politics. As is Toilet's sanctimonious tone and melodramatic inclinations that takes every possible complexity -- social, cultural or religious -- and shoves it down the viewer's throat in the garb of rushed protests and simplistic resolve. Toilet treads unevenly between movie and movement. 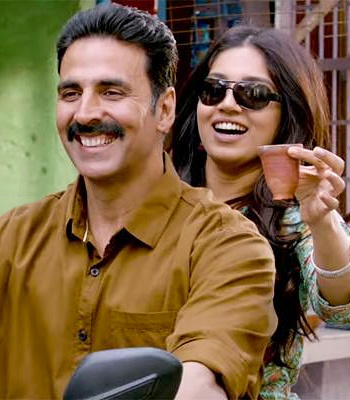 It only works well when it allows Akshay Kumar's influential charisma and Bhumi Pednekar's fiery spirit to use their instinctive humour, warmth and spontaneity to build a relationship that's based on something more sound and striking than the sight of Sudhir Pandey's pee.